Trikes are nothing new under the sun, but they have always been regarded (and rightfully so) as a vehicle with a niche purpose; delivery vehicles, meter-maids rides, and as an alternative to two-wheels for riders unable to hold up a bike. They don’t handle particularly well, and behave poorly in the corners. Much of this changed with the advent of the “funny backwards trike” that places the third wheel up front. Suddenly, trikes corner as if they are on rails, and the genre has broken out of its traditional customer base. 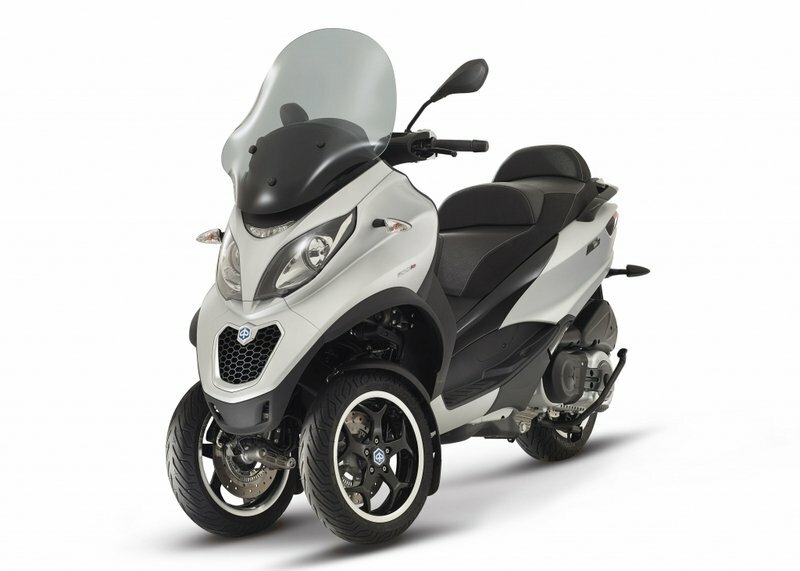 The MP3 profile looks much like any other scooter, albeit with an exceptionally beefy front end. This perception changes rapidly with your perspective as you move around to look at it head-on. Now we see the major feature upon which all other design considerations revolve; the dual-wheel front end with its articulated quadrilateral steering and suspension, which is what gives us the fat front end, ’cause the independent suspension members need room to work. This setup grants the MP3 an uncommon combination of attributes; stable enough to be self-supporting without using the centerstand, yet capable of an astounding 40-degree lean angle in the corners. Much of the rest of this ride is fairly typical at a glance. 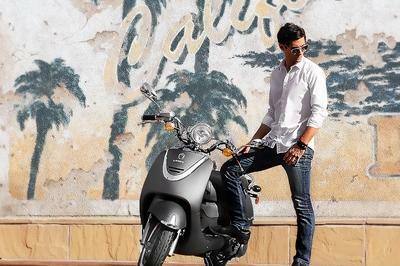 The step-through frame, running boards, under-seat storage and swing-mount motor are pretty standard fare for the scooter sector, and most of the really nifty stuff is hidden under the hood, as it were. One design feature I really like is the stadium-style pillion pad that places the passenger in a position to see over the riders head, or at least around it. After all, what fun is it to ride on back and see nothing but the back of the rider’s jacket! Though the factory made some adjustments to the frame to increase torsional rigidity, and tweaked the steering rake out one-quarter degree, the real showpiece of the chassis and suspension is the front end. A parallelogram-type rack allows the front wheels, as well as the rest of the scooter, to bank into the turns a la two-wheeler style. This comes with a number of benefits, not the least of which being the doubled traction up front, independent wheel travel that increases traction on irregular surfaces (such as rain-slicked cobblestone streets) and twice as much “brakeage” up front where you need it the most since 70 percent of your stopping power comes from the front brakes. To put it bluntly; you would have to try real hard to pull a lowsider on this thing! 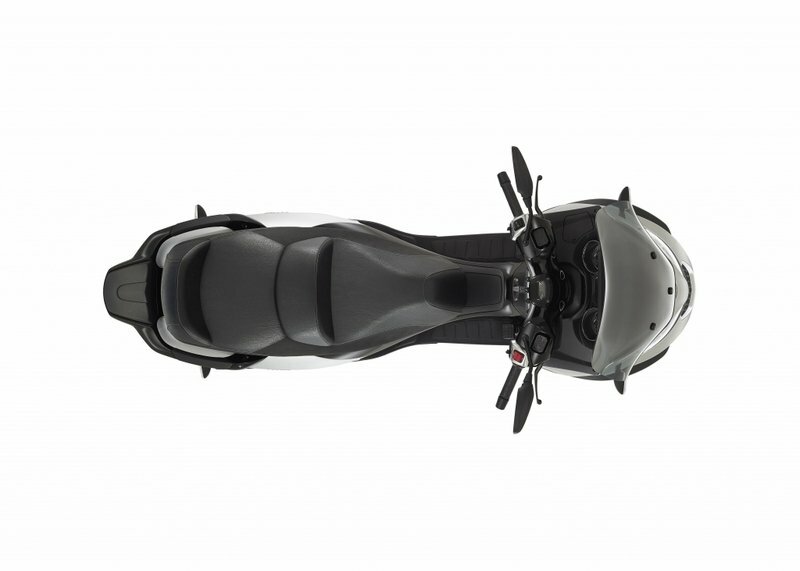 Piaggio doubled down on the traction preservation angle with a feature normally only seen on bigger, more powerful machines; a dynamic traction control system Piaggio calls the Acceleration Slip Regulation (ASR) system. Wheel speed indicators monitor wheel rotation, and moderates power output via the Ride-by-Wire throttle control system to prevent loss of traction at the rear wheel when you get a little too twisty for the conditions. It’s just a little lagniappe for people looking to buy a ride with safety features taken to the nth degree. The final drive is typical, with a dry, centrifugal clutch and “Twist ’n Go,” Continuously Variable Transmission (CVT); another feature that makes the MP3 500 particularly suited to inexperienced riders trying to break out of their cages for the first time. The MP3 goes for $9,199 for 2018, and you can get it in Military, Matte Silver, Nero Opaco Carbonio. This price does not include shipping and dealer setup, so bear that in mind as you dig into the accessories catalog where you will find plenty of opportunities to pad the sticker. 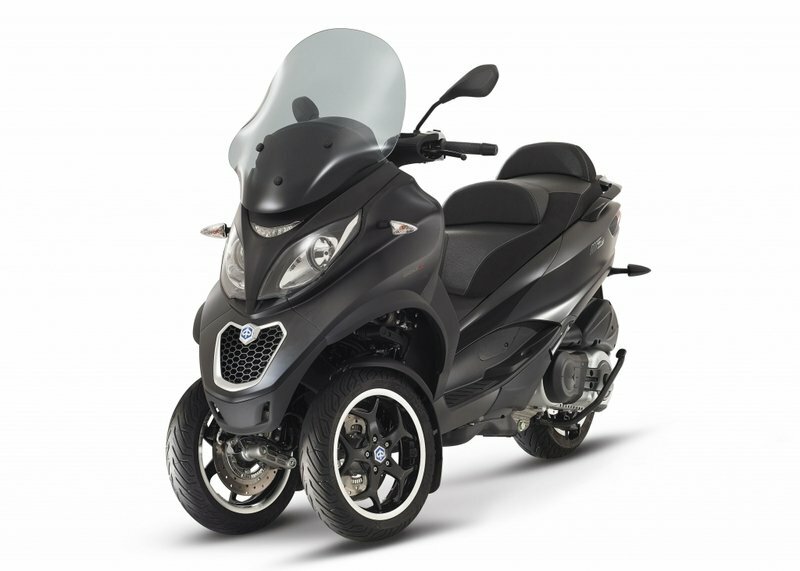 A few years ago, Yamaha’s Tricity would have been a good three-wheeled competitor because of the tilting front wheels. While the Tricity is still in the 125 cc niche in other markets, it hasn’t come to the North American market, though a 155 cc version was displayed at the 2016 Osaka motorcycle show with hopes of it appearing in the European markets. There is still hope, but the Tricity hasn’t been the success Yamaha hoped for when it was introduced in 2014. 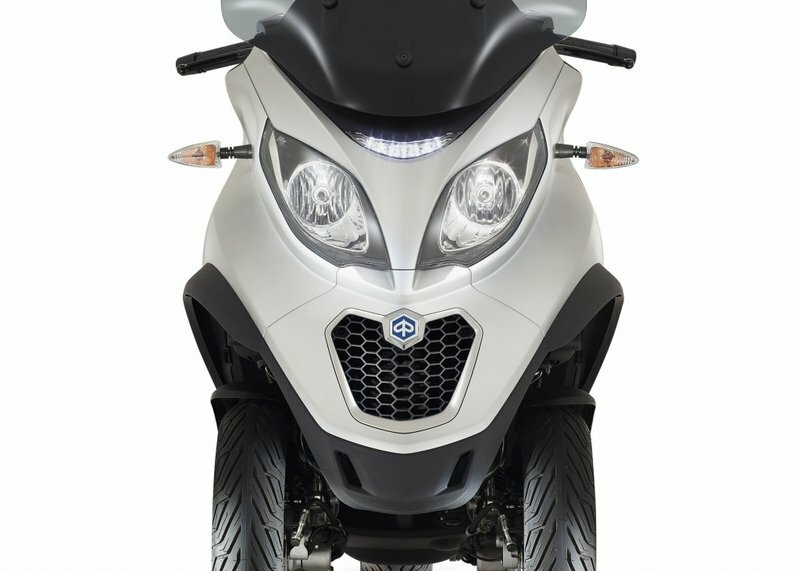 Due to the lawsuit from Piaggio, Yamaha reconfigured the Tricity’s front end with a dual-fork setup that does the same thing as the Piaggio suspension, just in a different, non-patent-infringing way. Another out-of-market contender is the Metropolis 400 from ­Peugeot. 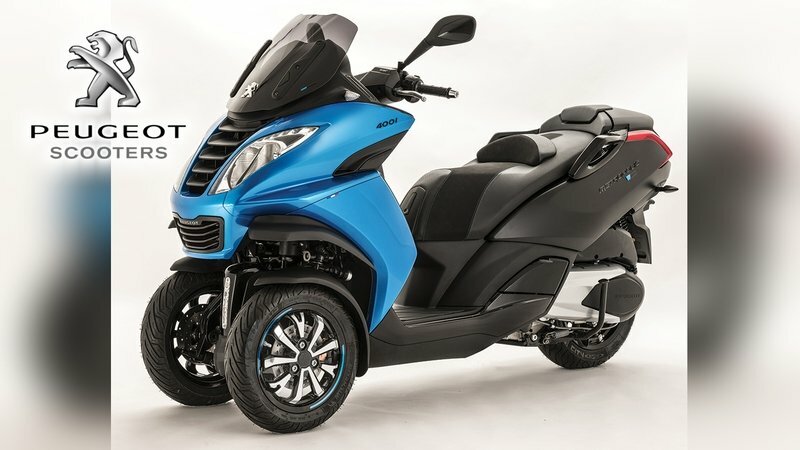 It would be a closer competitor as far as engine size but Peugeot doesn’t have any motorcycle or scooter dealers in the U.S., so it is even less likely we’ll see the Metropolis on our shores than the Tricity. Taking those factors into consideration, lets go with the Tricity. If someone has a better head-to-head for the MP3, put it in the comments section and I’ll give it a look. They’re both scooters, so yeah, both run with the typical swing-mount engine/drivetrain combo. Both engines are water-cooled one-bangers, and both run with some sort of automatic transmission. 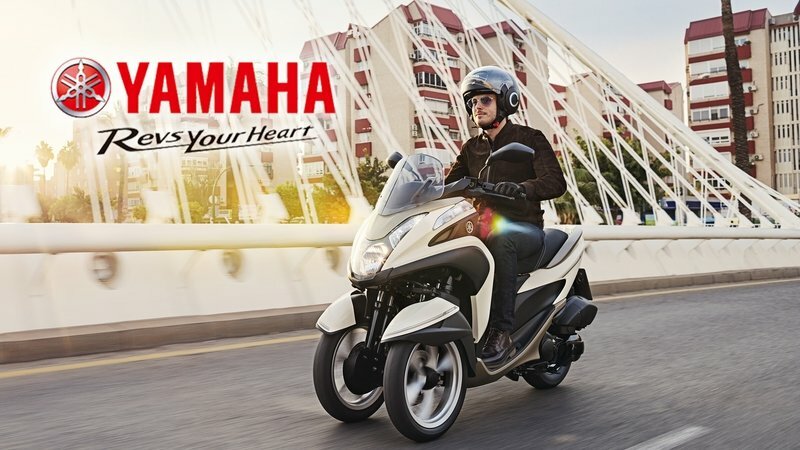 The similarities end there; while Piaggio went with a relatively large, 492.7 cc engine, Yamaha stayed down at 124.8 cc – a pretty big gap, but I’m sure they did that for European and UK licensing conventions. Still, the Tricity only generates 10.8 horsepower and 7.6 pound-feet of torque against the 40.1 horsepower and 33.5 pound-feet of torque from the MP3, leaving a pretty large performance gap. Both have the typical under-seat storage, and though Yamaha says it has “plenty of storage” they don’t follow up with a quantifiable space. Piaggio designed its storage compartment to hold two full-face helmets, or one helmet and a pile of books, groceries or whatever. The Tricity lacks the stadium pillion of the MP3, and so isn’t quite as passenger friendly. The MP3 500 comes with ABS and Yamaha offers unified brakes as standard. Which is better is a personal preference. 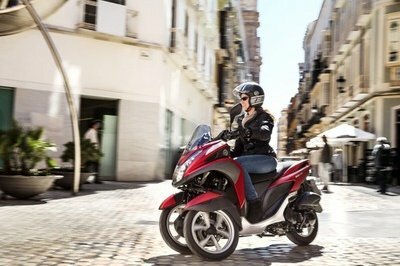 Piaggio takes it a “step” further (get it?) with its foot pedal actuated combined brake feature. A big boon for the MP3 here is the ASR system, which puts big-bike technology at the rider’s fingertips and adds a bit of safety for the inexperienced rider and fiery-eyed pegdragger alike. The Tricity has no such system, but to be honest, with such a small engine I doubt one could justify a gadget that prevents you from accelerating too fast. Probably not a problem. Ever. Yeah, I know I’m comparing a flyweight to a middle-ish weight, but unless you need to keep the displacement down for licensing reasons, you want a funny-backwards-trike and the MP3 is available, it should occupy the first, second and third slot on your short list. My wife and fellow writer, Allyn Hinton, says, "I really like these parallelogram front-end scooters. 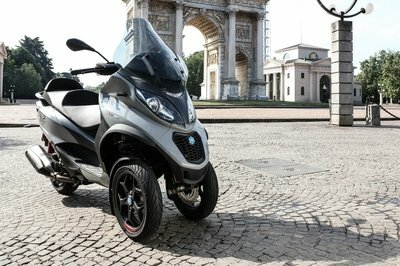 I know Piaggio took issue with the Tricity and Peugeot’s Metropolis. Teams of lawyers fought it out, but the MP3 is the only one of the three available in the U.S. market, at least at this time. 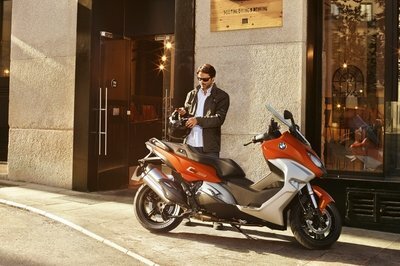 A Tricity with the 155 cc engine would be awesome. I’m sorry it hasn’t been received better in other markets." Front Suspension: Articulated quadrilateral consisting of four aluminum arms sustaining two steering tubes, and leading arm suspension geometry with offset wheel axle. travel: 3.74 inches. Electro-hydraulic suspension locking system.